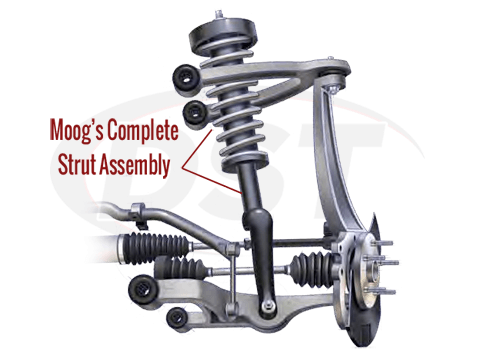 Moog Front Strut Assemblies are a simple way to replace several worn suspension components with one bolt on part. Find front strut assemblies and coil springs specific to your vehicle below. The Complete Strut Assemblies feature a superior design and construction over the OE design. Moog continues to create total undercar solutions with the Moog Problem Solver line of Steering and Suspension parts available directly through us at DST. The Complete Strut Assemblies feature a superior design and construction over the OE design. Highlighting the assembly is the Triple Piston Rod Seal. 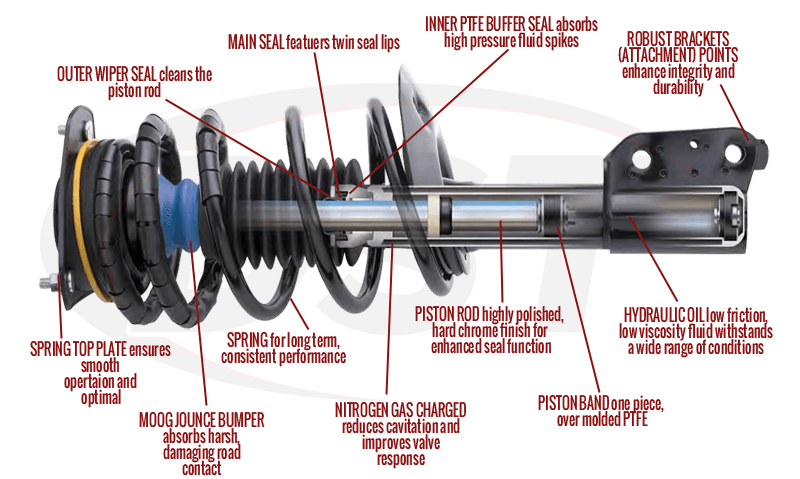 The outer wiper seal cleans the piston rod, preventing any harmful road contaminants from infiltrating the strut and damaging the main seal. The main seal is a one piece molded design that features twin seal lips, optimizing steering performance and enhancing durability. Finally, we have the inner PTFE buffer seal. This inner seal absorbs high pressure fluid spikes that are caused by rough road impacts, improving the efficiency of and increasing the life of the main seal.